For many years, people have relied on sandbags to prevent floodwater from entering their homes and inundating properties. They’re cheap, easy to obtain, and can keep out water for short periods. A pre-filled traditional sandbag, however, can weigh around 13kg so it requires heavy lifting or a lot of manpower. When the flood is over, they become dirty rotting bags that hold contaminants such as sewage, pollution, riverbank seepage, bacteria, and other environmental hazards. They also can’t be dumped in the local landfill but must be disposed of properly as hazardous materials which can be costly. Flooding experts also attest that sandbags are ineffective compared with alternatives, which means you can still fight off floods without back-breaking work and causing further harm to the environment. One of the most effective ways to prevent flooding is to purchase a transportable flood fence barrier. People are used to the idea of using sandbags to help prevent homes from flooding. The truth is that sandbags aren’t actually the most useful tool for this job. They can definitely help, but there are modern sandbag alternatives that have far exceeded what a sandbag is capable of doing. These transportable flood fence barriers are perfect for keeping the water away from your property. You will be able to position these flood fence barriers wherever you need them to be. The general idea is that you will be using these fences to create a perimeter around your home. If you had enough fencing, it would be possible to create a barrier around a large property to keep flooding from becoming a major issue. Moving these transportable flood fence barriers around is pretty simple overall. They aren’t too cumbersome and most people who have average strength will be able to set them up without having any issues. They aren’t really any more labor intensive than slinging around some sandbags. Even so, they will take a bit of preparation to use them properly. You will need to use these flood fence barriers in advance for them to be effective. Setting up the flood fence barrier will take some time, so you’ll need to be able to act before the flooding reaches your home. This solution will be less useful if the flooding is already occurring. This is a preventative measure to take in advance of a major storm. The transportable flood fence barriers work excellently to protect your home from major flooding. Setting up these barriers isn’t too difficult and you should be able to create a perimeter around your home. Once everything is set up, you’ll be able to feel a lot safer. If you have enough fencing, then you should be able to prevent even a large property from flooding. These fences are not inexpensive, so you will have to pay a fair amount of money to make use of this solution. It also isn’t something that you can use as easily to stem the tide if the flooding has already begun. This fencing is best used in advance to get ready for potential flooding. It works great, but the high price point and limitations may turn some away from this option. 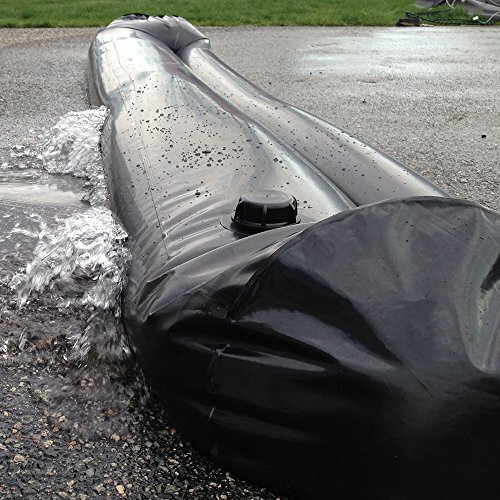 Another interesting alternative to traditional sandbags is the plastic poly tube flood barrier. These long plastic tubes can be pretty large. Sometimes, they may be as long as 50 feet or so and they can be filled with various substances. People do, sometimes, fill these poly tubes with sand, but it is more common for people to use dirt. The large barriers can act as an effective tool to stop the flooding in its tracks. The general idea behind how this works is pretty much the same as normal sandbags. It is a big obstacle that prevents the water from going any further. The fact that these tubes can be so long and will be quite high once filled is going to make them work perfectly. Sometimes laying these flood tubes can be a bit trickier than using a traditional sandbag. With a normal sandbag, you will be able to pick it up and set it down where it needs to go. You can do the same thing here, but it will be a bit more cumbersome once the tube is filled. It may be best to have a couple of people to carry or drag this flood barrier into the right position. 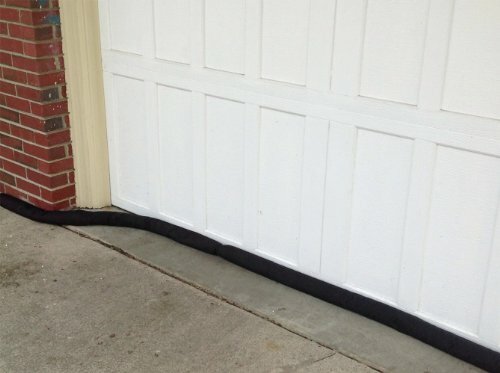 This poly tube flood barrier is an effective way to prevent flooding in your home. Filling it up with either sand or dirt is a pretty easy process. You’ll be able to position it properly and it will work great to keep the water at bay. These tubes can be pretty high when filled up to capacity as well, so one of them may be enough to suit your needs. Moving this tube once it is filled is a bit tricky. This is essentially the same thing as using a sandbag, but it is just a different way of going about things. If you want to use something that will be a bit quicker than slinging a bunch of sandbags, then this could work out. It just depends on how easily you can move this into position and how quickly you can fill the tube. You can also choose to fight flood water by using even more water. This may seem like an odd way to put things, but this is exactly what you will be doing if you choose to buy one of these inflatable dams. You will be able to fill up one of these dams with water to create a barrier. This is a lot quicker than filling the plastic tube mentioned above, and you’ll be able to place the dam where you need it before filling it. Simply use your hose to fill up this inflatable dam and you will be able to create an effective barrier to protect your home. These inflatable dams can be very high and will keep even high flood waters at bay. This is an elegant solution to an unfortunate problem. When you need to protect yourself from flood waters as quickly as possible, it will pay off to own one of these. You might wind up needing several of these though. The ideal solution to protect yourself from flooding is going to be to create a perimeter around your entire home. Doing so is going to require several of these inflatable dams and that could wind up getting pretty costly. If you have the money to spare and want to be prepared for a potential flood, this is going to be the easiest solution available to you. Using an inflatable dam is decidedly easy and it will work very nicely for your purposes. You can stop your home from being flooded and you will be able to get everything set up relatively fast. The inflatable dam should be high enough to stop even significant flooding from touching your home. It’s a great solution to consider when you have the money to invest. Buying enough of these inflatable dams to create a perimeter around your home could be expensive. This might not be a practical solution for everyone due to the cost barrier. There are many positive qualities that make this inflatable dam worth owning, but it may not be the right solution for you. You will have to weigh your needs against the cost of these types of products. There is also a convenient DIY option that you can use to make your own type of sandbag. If you have some garbage bags that you can spare, then you can fill them up with either dirt or sand. You should have plenty of dirt outside of your home that you can use for this purpose. Filling up a garbage bag with dirt shouldn’t take too much time to do, and you’ll be able to use them just like you would a normal sandbag. Of course, you will likely need several garbage bags to accomplish what you are setting out to do. The problem with this is that you may not have enough time to get everything completed. If you are preparing for flooding far in advance, then you will have enough time to properly make use of this method. It still might be more practical to make use of actual sandbags in this situation, though. The big benefit is that you will have these materials around your house already, in all likelihood. Using several dozen garbage bags and filling them up with dirt can help you to create a really good flood barrier. It won’t cost you any money to use this solution if you already have the garbage bags. Even if you do need garbage bags, they can be purchased at a very low price. You may not need to leave your house to get what you need to make this sandbag alternative. This is a method that allows you to use materials that you likely have sitting around your house. 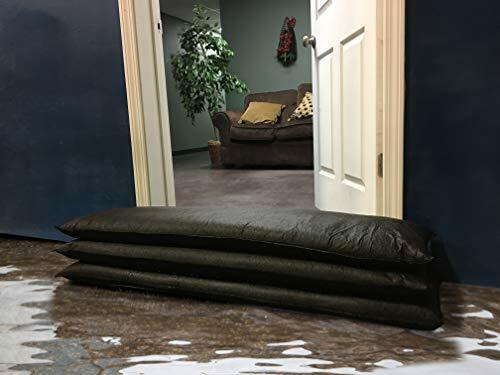 You shouldn’t have any problems setting up your flood barrier and this might save your home from significant water damage. It all depends on how much time you have to set things up. The usefulness of this DIY method is largely dependent on whether or not you have other items available to you. If you have the ability to go buy some sandbags, then that is going to be a lot quicker than filling up garbage bags with dirt. Also, if you don’t have garbage bags sitting around the house, then you will need to go to the store anyway. This is also fairly labor intensive, so it isn’t going to be the easiest possible solution that you could think of. Sandbags are lightweight and disposable. They’re filled with white, granular cross-linked polyacrylamide which binds together when wet, acting as a barrier for water to get through. Flood bags are made up of non-hazardous sodium acrylate that soak up 20kg of water in just a few minutes. They weight 600 grams and lasts from 5 to 10 years. Absorbeez is sandless and has dimensions of 600 mm x 300 mm. Each bag absorbs 16 liters of water so it’s easy to transport or store. The Sorbarix is a water absorbent cushion that’s made up of a tear-resistant outer cover and super-absorbent polymers inside the bag. Each cushion weighs 400g, can absorb 20 liters of water in two minutes, and has a shelf life of five years. 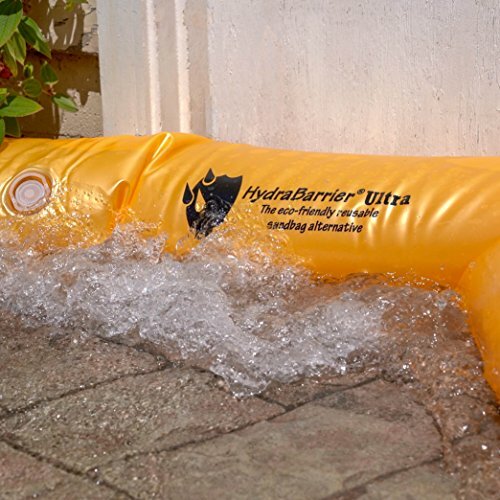 The HydraBarrier is 6 feet long x 10 inches wide x 6 inches high and made of 22-mil thick vinyl that weighs about a pound each. One unit is equivalent to four sandbags. NoFloods Barriers is an inflatable dam that can be deployed up to 200 meters or more. It’s lightweight, flexible, and can be configured into various shapes and sizes. This was tried and tested during the flooding in France in January 2014. FloodSax weighs 7 ounces and is made up of a semi-porous inner liner with a special gelling polymer. They mold into doorways to keep floodwater out. Quicksandbags are biodegradable sandbags made up of woven jute hessian outer cover and a cotton liner which contains a super absorbent polymer (SAP). Each bag weighs 450 grams and has a shelf life of up to five years. The HydroSack is another sandless sandbag that has dimensions of 480(W)x600(L)mm. It absorbs up to 20kg of water in 2-3 minutes. Aqua-Sac is a biodegradable self-inflating sandbag that’s made up of a heavy-duty Jute sack for its outer cover, a cotton liner with its patented center stitch and a super-absorbent polymer. The bags are 54cm long and 10cm high and weigh 13kg each.